You can see him enter the store on the surveillance video. The boys follow after him, looking left, then right, then ducking through the doors. His head emerges first near the door’s bottom, fear—a grainy light flickering where from his eyes should be—as they pull him out, meat onto the sidewalk. He doesn’t stop flailing, trying to break free. Lesandro Guzman-Feliz. Ese era su nombre. He was fifteen. In his school picture, he smiles, two diamond earrings framing a handsome face. His maroon sweater balloons across his broad, teenage chest. Bursting. Bulging into manhood, into his future. In the picture, the blue backdrop hangs, the photographer must have been saying: give me a smile, a big smile now, handsome man, yes, just like that. Perfecto. And if you click, and click, and click the links, you can see bits of his life. After death, small snippets too potent with pain. This same boy, cackling at the “pop” of the ear-piercing gun. Sitting on the stool and laughing into silence, the jewel, re-homed, now shining from his lobe. I don’t know, his mother says. I don’t know, what am I supposed do now? A microphone plants itself in her new life, the News 12 logo rude and blue. Her skin smooth, darkness gathered in semi-circles beneath the brown of her eyes. The video blurs blood, It’s Junior! they yell, the sounds of sirens distant on dark streets. Hay sangre por todos lados: The red shimmering from the base of his neck, waterfalling down his little-boy calves, as he lays buckled on a nameless corner. The sidewalks specked with gum spots, that days later will well up with candle wax, reds, blues, yellows, and whites, and wind that won’t let them burn. See the street sign, 173rd and Bathgate. The poster of the virgin of Guadalupe, her long green glorious robe, her center-parted cool black hair, hands folded before closed eyes. And black bubble letters that dance around the oak tag signs on the store window grate: #JusticeForJunior, Sleep in Peace. I’ll be right back, he must have told her over the clicking of the dead bolt, a five-dollar bill in his hands. I wonder if she heard his feet echoing down the stairs, as she began her eternal wait for him to come home. It’s a centimeter away on the subway map. A fingertip’s distance. Independence Avenue, a small tree-lined street. Chickadees and black squirrels by day, skunks and lightning bugs by night. We run away and then toward them, all shrieks and squeals. Our patio is lined with lavender. Tomato plants crowd and burst from soil, the stone pavers scorch our toes from a pounding sun. We curl our feet along the shaded spots, we stand. Leaf crumbs and dirt specks swirl in the water of the kiddie pool, duct tape pressed along its tears. The two girls had been pushing each other in a Little Tykes car, barefoot, bathing-suited. Hay Sangre por todos lados. She holds her toe, sobs. It’s gushing, I tell my husband on the phone. Put sugar, he says. She cries when I spoon it from the jar onto her open skin. On her feet? The little one squeals, and the three of us howl together. I focus on her breath, her body—warm against my chest, bikini bottom in bunches around her small behind. I tell her she’ll be fine, looking out over her shoulder at the marigold leaves that yellow in sections from hammering heat. What makes her safe, her streets empty and landscaped? Her five dollars from lemonade sales folded and zipped into a sheer pink pouch, in a drawer beside her bed? ¿Por qué ella a está salvo? I ask the question again, but I know the answer. It’s in millimeters—tiny lines stacked in a row, straight like blades of grass. An index finger, chipped polish, pressed over the distance between Independence and Bathgate Avenue, one side of the Bronx to the other. I cover the miles of cars and Styrofoam strewn along streets and water sold out of cardboard cases where traffic bottlenecks on the entrance to the Bruckner Expressway. Push my finger harder until the blood in its tip retreats to white. I cover the part of the paper that’s kept her veins flowing from a pulsing heart. She looks up at me, eyes wet. When do you come back, she asks, after you die? You don’t, I tell her. No haces, y no lo haces. Emily James is a teacher and writer in New York City. Her work has been featured or is forthcoming in The Atticus Review, The Rumpus, JMWW Journal, Hippocampus, Mutha Magazine, Firewords Journal, among others. You can find her on twitter at @missg3rd. Becky Kolsrud (b. 1984) is a painter who lives and work in Los Angeles, CA. 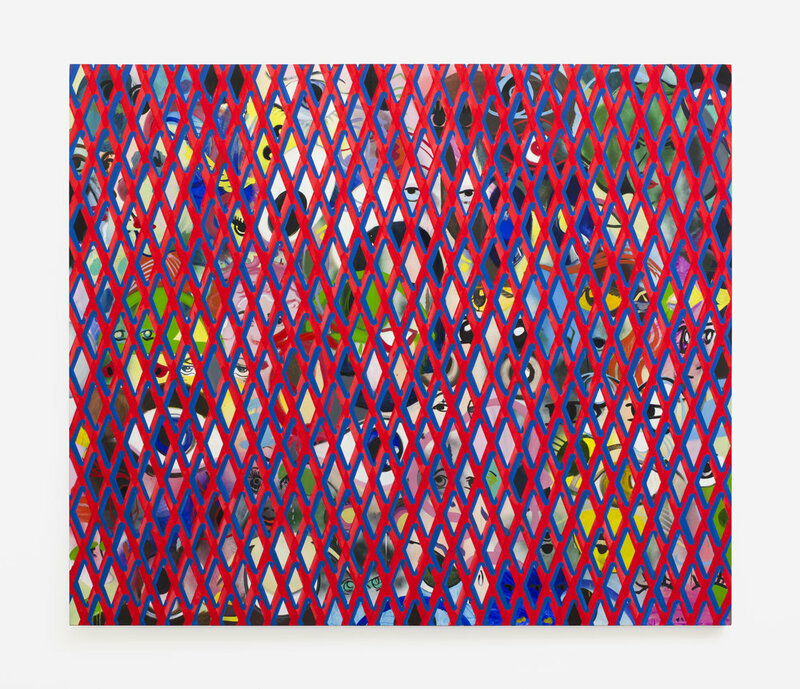 Her works often feature imagery of women layered with scrims, fabrics, or security gates. Kolsrud’s use of this latter architectural element common to the Los Angeles landscape is an efficient means of camouflaging her figures directly in front of the viewer. Their abstraction becomes a form of protection or defense. It acts as a curtain, a peephole, an obfuscation, an exterior, an interior, a gesture, and reveals as much as it hides. She received her BS in studio art from New York University and an MFA in painting from UCLA. Solo exhibitions include “Allegorical Nudes at JTT, New York, “Heads and Gates,” at Tif Sigfrids, Los Angeles (both 2017), “We Alter and Repair” at JTT, NY (2014), “Becky Kolsrud” at JTT, NY (2012) and "Yackety Yack Girls," at Karma, NY (2011). Recent exhibitions include “L.A Dreams” at CFHill, Stockholm (2018), “Marching to the Beat,” Jessica Silverman Gallery, Los Angeles (2017), ”Milk of the Poppy" at Capital, San Francisco (2016), “I Am Silver” at Foxy Production, NY (2016), “Mal Maison” at Maccarone, NY (2016), and “The Whispering Eye,” a two person exhibition with Gina Beavers at JTT, NY (2015/16). Kolsrud is represented by JTT in New York and Tif Sigfrids in Los Angeles.